Many an NFL opponent has had a game plan waylaid by the speed, strength and instinct of Aaron Donald over his not-yet-five-full seasons in the league. 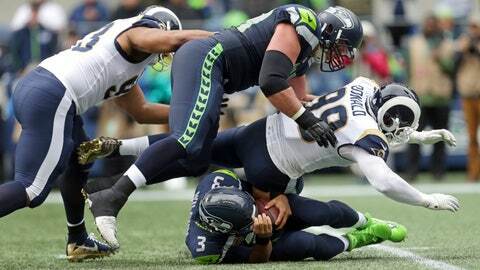 The 6-foot-1, 280-pound kingpin of the Los Angeles Rams‘ defense was a unanimous pick for the best defensive tackle in the NFL by a panel of 10 football writers for The Associated Press in this week’s edition of the position rankings. “He’s been as disruptive as anyone on the interior, ever, since entering the league,” said the AP’s Josh Dubow, who is based in the Bay Area. Just ask the Minnesota Vikings. The Rams had a 10-point lead on Minnesota last month, but the Vikings were on the move as the fourth quarter began and Kirk Cousins dropped back. Donald leaped off the line to engage with his blocker, before breaking free to the inside of the guard with a textbook swim move. After shoving the center aside, Donald darted forward and swallowed up the quarterback with a bear hug for a 10-yard loss and a harbinger for a punt. The Vikings still had a chance later in the game, trailing by just a touchdown, when Cousins settled in the pocket looking to pass. Donald veered right this time to squeeze between the guard and the tackle, foiling a desperate attempt by the center to slow him down as he closed in on another sack. After tossing Cousins to the turf , Donald simply pointed to his right biceps for his latest celebration. Donald also topped the AP rankings for defensive tackles last year. After staying away from offseason workouts for a second straight year to protest his lack of a new contract, the Rams finally relented at the end of the preseason with a six-year extension for Donald worth $135 million. For the Rams (5-0), one of the NFL’s two remaining unbeaten teams, the defensive tackle tandem of Donald and newcomer Ndamukong Suh has the potential to change a game as much as their high-octane offense. “It’s almost unfair the way the Rams have stocked up on their defensive line,” said the AP’s Teresa Walker, who’s based in Nashville. Suh finished fifth in the voting released Friday, following Geno Atkins of the Cincinnati Bengals, Fletcher Cox of the Philadelphia Eagles and Gerald McCoy of the Tampa Bay Buccaneers. That’s quite the quintet of experience, power and quickness at a position that’s as stacked with elite players as any around the league these days. Donald, Atkins, Cox, McCoy and Suh have played a combined 39 seasons and been picked for the Pro Bowl 24 times, with a cumulative total of 250½ career sacks playing a role that’s predicated on stopping the run first. Suh and McCoy were the second and third overall picks in the 2010 draft. Atkins, who went in the fourth round that year, is in the top two with Donald in sacks, quarterback pressures and quarterback hits over the last five seasons. This year, Atkins is tied for the league lead with six sacks. “Doesn’t seek attention, but his consistent excellence demands it,” said the AP’s Simmi Buttar, who’s based in New York. The only new addition to the top 10 from last year’s rankings was Jurrell Casey of the Tennessee Titans, who finished sixth. Kawann Short of the Carolina Panthers was seventh, DeForest Buckner of the San Francisco 49ers was eighth, Linval Joseph of the Minnesota Vikings was ninth and Damon Harrison of the New York Giants was 10th. Yes, that was Joseph rumbling down the field last week with a fumble he caught midair and returned 64 yards for a touchdown . “Might be the fastest 330-pound guy in sports,” said the AP’s Rob Maaddi, who’s based in Philadelphia. Now that’s a true defensive tackle.